Today I am linking up with Lauren Elizabeth and Meet at the Barre to share what I’m loving this Friday. This weekend I am seeing Aaron Carter in concert! I never thought that at the age of 23 I would be saying that. I was able to convince a friend to tag along, and I know we will have a blast! Thank goodness for friends that are willing to go along with all of my awesome ideas, ha! I used to be a huge Aaron Carter fan when I was growing up, and I had those Teen Bop and Tiger Beat tear outs hung up all over my doors in my room. Does anyone else remember those?! My roommate is obsessed with burning candles, and lately, she has been burning the perfect fall scents. I really like the apple crumb cake scent and pumpkin spice (surprise, surprise) scent. And, at work, people have scentsy burners, and yum! One of my coworkers has one that smells just like warm sugar cookies. Delicious. But, it does make me slightly hungry. So, what I am really wondering is has pumpkin always been this popular or did Starbucks’ pumpkin spice latte really amp it up a notch? Irregardless, I love pumpkin everything (minus PSL, sorry) , but I especially love healthy pumpkin treats. This dip is delicious, and I highly recommend it! Try it out. You won’t regret it! Well, remember when I said I had a stress fracture? I actually didn’t. I had an MRI, and it came back all clear! No hairline fractures to be found. But, I do still have something wrong with my foot. Thankfully, my doctor referred me to the physical therapist, and I have been feeling a lot better. 5. 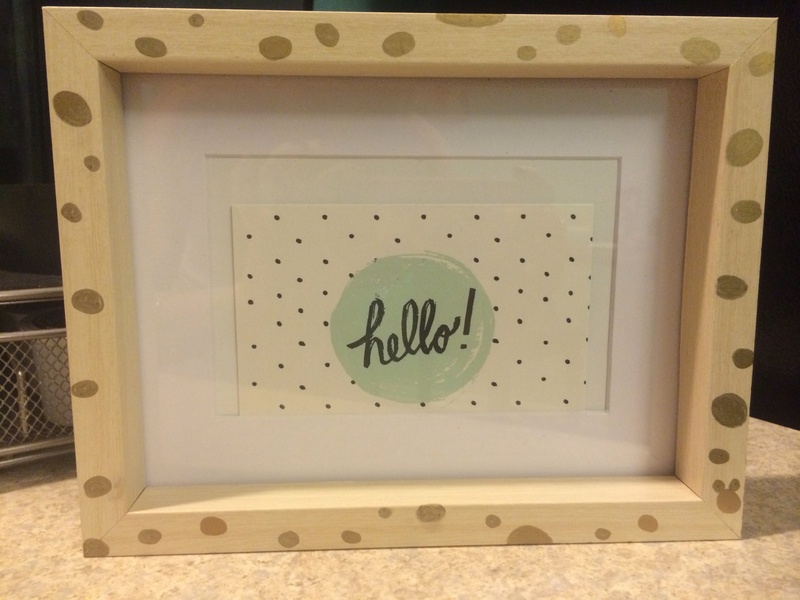 Easy DIY Picture Frame. In an attempt to be crafty, I bought a cheap picture from and decorated it with a gold Sharpie. I’m not even sure if this really counts as a DIY, but I’ll go with a yes. : ) Can any Disney fan out there spot the “hidden” object?! I would recommend penciling out what you want to do before you start drawing on your frame! What are you looking forward to doing this weekend? Would you eat breakfast for any meal? If so, what breakfast food would you want? Thank you for stopping by! Have a fantastic weekend! Is it just me or does pumpkin always seem to be in some of the unhealthiest dishes? Pumpkin muffins, pumpkin pie, pumpkin bread, pumpkin bars… Where are some lightened up options? Today, I have a delicious Greek yogurt pumpkin dip recipe. The recipe is light and fluffy. if you wanted to, you could omit the Cool Whip to make it a healthier option. Let me know if you try that out. Combine all of the ingredients together. Add brown sugar or stevia if you prefer your dip a little sweeter. 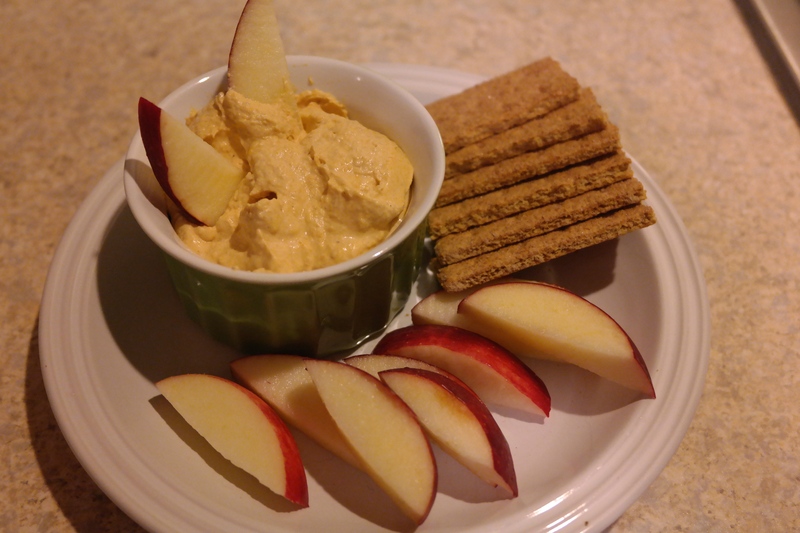 Enjoy chilled with sliced apples, graham crackers or by the spoonful!